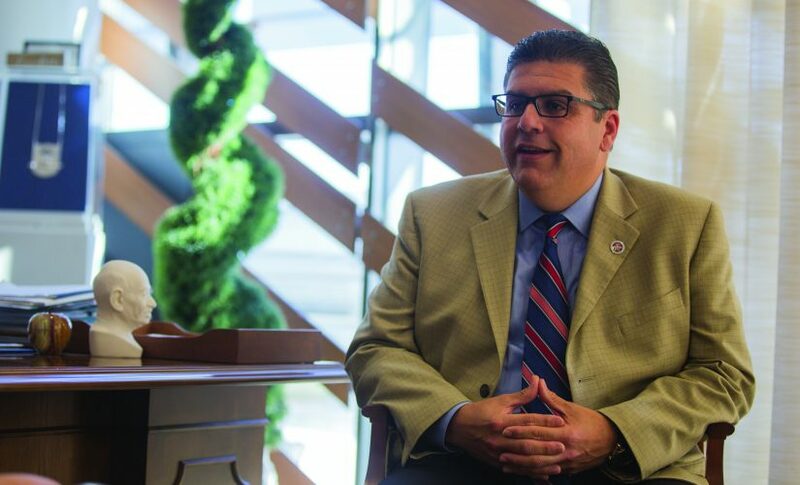 The Collegian recently sat down with Fresno State President Joseph Castro for a recap of his second year as president, describing what’s in store next for the campus, what impact his presidency has made thus far and what are some of the highlights of the 2014-2015 academic year for Fresno State meeting Castro’s challenge to be a “bold” university. Q: One of the many events you’ve been hosting this year has been the student panels. Specifically, there was pothole reconstruction in several parking lots on campus and I was curious if that came about because of the student panels. How successful have the student panels been, and how has student feedback been from you? I have really enjoyed having that opportunity to meet with the students and faculty and staff. We’ve done open forums. We did the social media forum a couple weeks ago. Every single time, I’ve learned something new–in a lot of cases a lot of things new–and that was one example where we learned about the potholes in some of the lots. Those have been fixed. …I appreciate the fact that students and faculty and staff love Fresno State so much that they want to let me know if they love what’s happening, or, on the other hand, if they think we’re falling short, and it’s very helpful to have that. Q: Recently we had the Armenian Genocide Monument unveiling, which has been one of the biggest events on the Fresno State campus. How important was this event to the campus community and to you, personally? That monument is very special. I do believe that last Thursday and Friday will be some of the most significant days in our 100-plus year history. … The project took about 100 days, and in a university, that’s lightning speed for a project. We put out 100 chairs last year for the groundbreaking, and several hundred came. So we put out 1,000 chairs last week, and almost 5,000 people came. That was magnificent to see so many young people, our elders in the community come, and how meaningful the Armenian Genocide Monument was to each and every one of them. As president, it’s one of the highlights of my career and my life. Q: One of the issues brought up during the Academic Senate meeting was impaction, not potentially having enough space to accommodate every student who wants to attend Fresno State and having to turn international students or out-of-state students away. How do you think Fresno State can address this challenge? Impaction is certainly a discussion that makes people nervous, and I get that. I look at the positive part of impaction, the number of students who want to come to Fresno State is increasing dramatically. It’s twice the state average, and that means that we’re doing something really good, and I like that, and I want to see more students consider Fresno State — first-generation college students and children of our alumni and other second-and third-generation students. So that part of it is positive. I would love for us to grow a little bit faster, and I’d love to see the governor and the legislature fund higher education at a higher level, and if they did, Fresno State could grow faster and accommodate more of the demand that is coming our way. Because that’s not happening as fast as it could, we have to make some judgments and some adjustments. Had we not declared impaction, we would have had to close the doors to any students regardless of their background, their talents from outside our four-county service area, and we don’t think that’s the right thing to do. There’s so many talented students right here in the Valley who live outside those four counties and want to come here and study agriculture, for example, or engineering or some other area where we are strong and unique, and I want us to leave the door open for those students. … We are going to look at several ways to ensure that this doesn’t do particular harm to any of our groups. You’re from a rural area, and we are especially concerned about students from rural areas, making sure that we are maintaining access to them. We’re expecting about a thousand international students this fall, so we’re seeing a slight increase compared with the overall population. Q: You previously talked about increasing salaries for faculty and staff on campus. Chico State, for example, has experienced a 15.5 percent pay-cut over the past 10 years, according to a report by CSU faculty. So what was your decision to change that for Fresno State? Every CSU campus struggled during the Great Recession, and Fresno State was one of those campuses. Most of our faculty and staff went six or seven years without any adjustment. Fortunately we’re in a positive place now financially where we can dedicate resources to that area, and I think all the CSU’s are looking at what they can do within their budget constraints. For us, this was one of the highest priorities, so as a campus we decided ultimately that compensation through the equity program would be our highest priority, and that supported our goal of ensuring that our students were served well. That’s why we invested. When you add all the dollars up through the faculty and staff equity program, it would be somewhere around $1.8 million, so we’re very proud of that. Q: Another issue that not only affects the Central Valley, but statewide, is the drought. 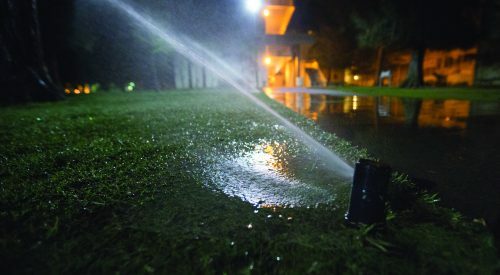 How important is the drought to you, and how is Fresno State making an effort to combat it? The drought is the single biggest challenge our region faces right now, immediate challenge. If that worsens, everything else that we are trying to accomplish becomes that much harder. So I’m praying for rain just like everyone else. Having said that, we’re working hard to reduce our own water consumption on the campus. I understand we’re near a 30 percent reduction at this point. I’ve heard from our facilities folks that we are trying to push that even further, so we’ve gone beyond where the governor has asked us, and that’s a good thing. I want us to be a model in that area. Q: Will student fees be discussed in the upcoming years? I imagine yes. I am not inclined to do anything quickly right now, especially as it relates to campus fees, but I want us to leave the door open for conversations for fees for certain areas. For example, we will begin discussion in the fall about a new student union, and a new faculty center, and as part of those discussions we will look at how we fund a new facility, and I imagine private support will be significant. We can finance part of it, and then we may ask the students if they would like to invest in something like that. I want to leave the dialogue open with the students about particular ways in which that could be beneficial. I don’t expect any tuition increases in the near term. I think that the governor has been very clear about that, and I’ve been very supportive of keeping the tuition at that level. From a meaning standpoint, the Armenian Genocide Monument. … In 100 years, that will be viewed as something hugely significant. I think the DISCOVERe program I’m very proud of. I think we’re on to something there in terms of the use of technology to advance educational achievement. So those two, and, of course, I’m really pleased that we were able to enhance the compensation for our people, and I want to continue to recruit and retain the best people, because by doing that, we are able to recruit and retain the best students. So I think we’re on the right path. I think the future is very bright.